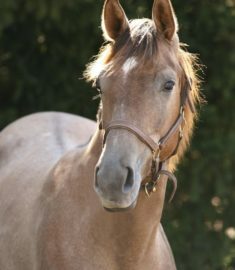 Gemini was cloned from the Thoroughbred gelding Gem Twist, the only horse named American Grand Prix Association Horse of the Year three times. Gem Twist also won two silver medals at the 1988 Olympic Games and was named “World’s Best Horse” at the 1990 World Equestrian Games. “You always dream about things like that,” his lifelong trainer Frank Chapot says. When an infection threatened his career, his rider Laura Chapot (Frank’s daughter) massaged him and soaked his legs in a whirlpool daily for almost a year, after which he achieved several more placings. “It was as extraordinary as it was nerve-racking,” says owner Michael Golden of Gem Twist’s career. Gem Twist retired in 1997 with a ceremony in Madison Square Garden and died in 2006. In 2008, his “identical twin” Gemini was born. He’s owned by the Chapots, who plan to stand him as a stallion to extend the exceptional genetics that otherwise would have been lost. His beautiful foals on the ground hold much promise for the future.